The Islamic State is at it again. More stories of atrocities against Christians continued to surface. In one, a Christian man, Meghrik, said the bus in which he was riding in Syria was stopped at what turned out to be an ISIS checkpoint. Three men dressed in black entered and began checking all the passengers’ identification papers. “Are you a Christian?” they asked him. “No,” he said. He explained that he was raised by Christian parents and his family name was Christian, but that he was not. “You’re lying,” the fighter said. “Your name says you’re a Christian. Come with me.” He was taken to an ISIS-judge who “concluded that he was a Christian” and said “You’re sentenced to death.” Thereafter Meghrik was severely whipped and tortured. At one point he was thrown in a hole in the ground and surrounded by an execution squad prepared to fire. After 10 days of this treatment and for unknown reasons—Meghrik cites a miracle and is now a devout Christian—he was released. February 13: A 57-year-old Christian laborer was shot and killed as he tried to fight off masked men trying to kidnap his young son from on a crowded street in daylight. The men, after murdering the father, seized his young son and took him to an unknown location (where, if precedent is accurate, he is likely being tortured or possibly killed, if a hefty ransom has not been paid). February 17: A 40-year-old medical doctor was killed by masked men who, after forcing him to stop his car, opened fire and killed him. He, also, leaves a widow and two children. February 22: Islamic State affiliates killeda 65-year-old Christian man by shooting him in the head. They then abducted and tortured his 45-year-old son before burning him alive and dumping his charred remains near a schoolyard. After the slayings, at least 300 Christians living in al-Arish fled their homes, with nothing but their clothes on their backs and their children in their hands. In a video of these Copts, one man can be heard saying “They are burning us alive! They seek to exterminate Christians altogether! Where’s the [Egyptian] military?” Another woman yells at the camera, “Tell the whole world, look—we’ve left our homes, and why? Because they kill our children, they kill our women, they kill our innocent people! Why? Our children are terrified to go to schools. Why? Why all this injustice?! Why doesn’t the president move and do something for us? We can’t even answer our doors without being terrified!” “We loved our country but our country doesn’t love us,” said the brother of one of the slain. West African Nation: According to a report, “Muslims radicals punished the [14-year-old] daughter of a Christian missionary for her faith by subjecting her to brutal female genital mutilation. Currently, the young woman remains in a coma, struggling for her life.” Lydia’s father, Yoonus, formerly a Muslim scholar, had converted to Christianity. When the local Muslim community heard of this—and that he “was now leading Muslims to Christ”—they “urged him to return to Islam and promised to give him gifts if he rejected Christianity. However, Yoonus and his family refused to renounce their faith, resulting in increased persecution” including the attack on his daughter. In such kidnapping cases, however, the authorities always settle the issue by accepting the minor Christian girl’s ‘conversion’ to Islam … never the other way around. In conversion from Islam to Christianity complaints, police go above and beyond their role to retrieve the girl and warn her of death from apostasy. Such cases suit the purposes of ideological jihad. By removing a non-Muslim young woman of child-bearing age from the Christian community, adding her to the Muslim girl population to bear Muslim children serves to increase the Muslim population while decreasing Christian numbers. Sudan: The government ordered the “demolition of at least 25 church buildings” in the Khartoum area, relates one report. The government claimed the churches were built on land zoned for other uses, although mosques located in the same area were spared from the demolition order. Christian leaders said this is “not an isolated act” but rather part of a wider “crack-down” on Christianity that “should be taken with wider perspective.” The Sudan Council of Churches denounced the order and called on the government to reconsider the decision or provide alternative sites for the churches. But Mohamad el Sheikh Mohamad, general manager of Khartoum State’s land department in the Ministry of Physical Planning, said the order should be implemented immediately. “Sudan since 2012 has bulldozed church buildings and harassed and expelled foreign Christians,” the report concludes. 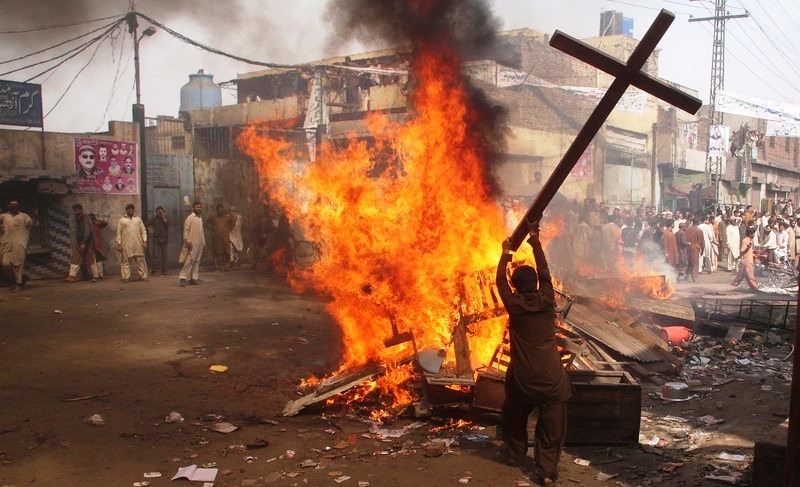 On the same day that the government arrested an elderly Christian man on the charge of blasphemy—which carries a maximum death penalty—it acquitted 106 Muslims of burning down an entire Christian village. On January 28, a mosque leader accused Mukhtar Masih, 70, of writing two letters containing derogatory remarks about the Koran and Muhammad. The report cites a source who said that “the charges against Masih were fabricated by local Muslims seeking to seize his property.” Nonetheless, police raided the elderly man’s home the same day and took his entire family into custody. His family was released but he was booked on charges of blasphemy, and beaten in an attempt to force him to admit to it. On the same day he was arrested, January 28, 2017, a Lahore court acquitted all 106 Muslims accused of burning down a Christian village—including 150 homes and three churches—in 2013, after one of its inhabitants, Sawan Masih, was accused of blasphemy. More than 80 prosecution witnesses, 63 of them with statements recorded about the attack, said they did not recognize any of the 106 accused. So they were all released. Iraq: Kurdish Peshmerga forces continue to be hostile to a Christian militia group also fighting the Islamic State. After William J. Murray, chairman of the Washington, D.C.-based Religious Freedom Coalition, visited the Christian town of Qaraqosh on the Nineveh Plain, he wrote that it “has enemies other than the ruthless Islamic State, or ISIS, which left it in ruins. Currently the Kurdish militia, the Peshmerga, is blocking aid to the NPU [Nineveh Protection Unit] that guards the town, because the NPU is the Assyrian Christian militia. It is the only armed Christian group in Iraq…. While for appearance and funding from Washington, the Kurds support Christian interests for now, the historical relationship between the two groups includes participation in slaughtering Christians by the tens of thousands. There is no room for a Christian enclave, particularly one that is armed, in the future of an independent state of Kurdistan…” Kurds are Sunni Muslims.